So as my head slowly clears today I thought I should try and put together some thoughts about the excitement of last night. 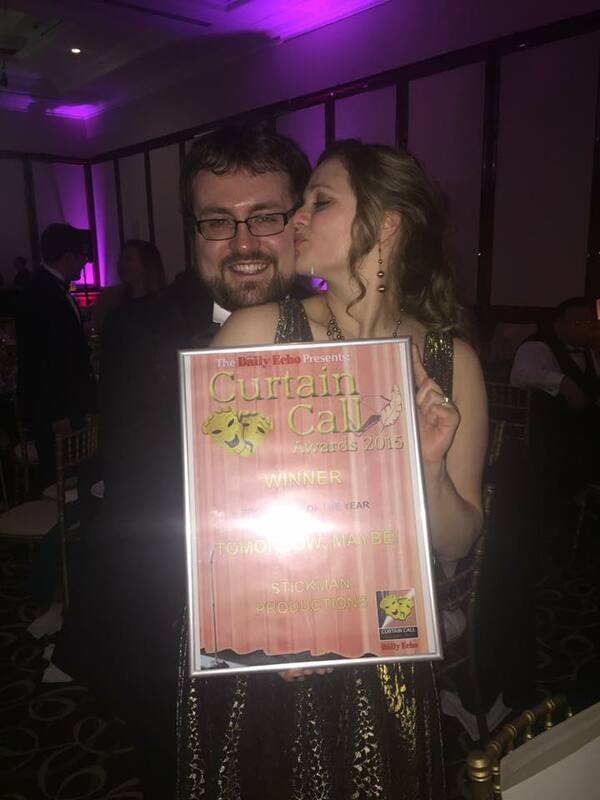 For those of you who don’t know, last night was the annual Daily Echo Curtain Call Awards ceremony. A chance for all the theatre companies in the South to get together and celebrate a years worth of brilliant local theatre. We were delighted to find out that the 2 shows we created in 2015 received 8 nominations for different categories. Last night Tomorrow, Maybe was the big winner, picking up 3 awards. Best Newcomer for the show, Best Musical or Opera, and the big award of the night Production of the Year. To pick up this coveted award for a show that is so special to all of us involved really meant a lot, and of course we celebrated well into the night. I really have to thank all of the team for 2015. it has been the best year ever for our little company. I was reminiscing with Becky last night that we have grown from a tiny company with half a table at the Curtain Calls to overspilling 2 tables with wonderfully talented and lovely people last night. To everyone I have worked with, thank you. Whether you were on stage or off, for either production, you have helped take Stickprod further in a year than we have thought was possible. It has been an honour to work with you all and I have learnt so much from it. Thank you to everyone who has supported the company, seen our shows and helped where you can. 2016 brings new excitement working with Amies and Clements and Aardvarks Can’t Jump Productions to bring Tomorrow, Maybe back to Asante in Romsey in April. Please keep your eyes peeled on Facebook, Twitter and on here as we will very soon be releasing ticketing information for the run. Don’t forget we sold out the full 2 weeks last time so make sure you get in quick to avoid disappointment.